At yesterday’s Landmarks Preservation Commission meeting, the vigilance of LANDMARK WEST! and our fellow preservation advocates paid off! 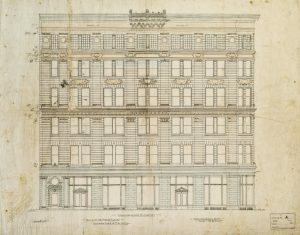 An applicant was seeking a Certificate of Appropriateness for 100 West 72nd Street, a McKim, Mead and White beauty on the corner of 72nd and Columbus Avenue which is part of the Upper West Side – Central Park West Historic District. You can read more about the building in LANDMARK WEST’s Building Database. The application’s presentation included historic tax photos alongside images of the present day condition of the building, which has been marred by non-historic aluminum sliders with transoms since the time of its designation. The applicant sought to legalize a number of aluminum sliders which had been without LPC consent, continuing the non-historic treatment of the landmark’s fenestration. What the applicant’s presentation did not include were two historic elevations dating from when the landmark was designed in 1892-93. These elevations show the elegance and thoughtfulness of the original windows designed by its architects, with one-over-one and twelve-over-twelve window configurations complimenting the surrounding masonry joints of the façade, presenting a unified and stately composition. LANDMARK WEST! 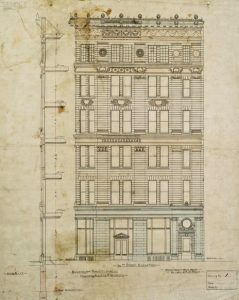 provided the commissioners with copies of these elevations, allowing them to observe the architects’ original intentions. The Commissioners were taken by these images. Commissioner Fred Bland asked who had shared the drawings with the Commission, and LANDMARK WEST! was given credit. Commissioner Bland noted that while in the past he has at times undervalued the role of windows, these images proved their value. ‘If there was a drawing that shows the importance of windows,’ he continued, this is it. He even concluded by saying he wished to publicly apologize for not previously giving windows their due credit! Other commissioners echoed Commissioner Bland’s sentiment of appreciation of the drawings. Considering these drawings, as well as the statements by LANDMARK WEST! and others, the direction of the Commission’s feelings on the legalization coalesced towards opposition. The discussion continued with Commissioner Jeanne Lutfy saying she happened to agree with Commissioner Bland, LANDMARK WEST!, and others who spoke, saying that the aluminum sliders do a disservice to the building. Some in the Commission, most notably Chair Srinivasan, expressed that while they would like to see the building’s original window configurations restored, they had no problem with legalizing the current situation before them. Others, however (Commissioner Lutfy chief among them), continually pushed back against this position. Why, it was asked, would the Commission allow such windows to be legalized, if the ultimate goal would be to have them replaced with the original window configurations? In the end, the Commission moved, after a flurry of rewriting and reorganizing their statement, to deny legalization of the windows in question, with a 6-year allowance for the applicant to fix the issue. It was a heartening moment in a process with is usually almost automatic in its continual approval, proving that dogged advocacy—the week-in, week-out work of LW!’s Certificate of Appropriateness Committee and our staff—can and does make a difference. To learn more about 2017 Certificate of Appropriateness applications, and to follow LANDMARK WEST! testimony, check out our C of A page.